Almost all newly built commercial or industrial buildings require automatic fire sprinkler systems for life safety, the protection of the property, the safety of the firefighters, and to minimize business interruption. These systems are designed and installed as prescribed in the National Fire Protection Association (NFPA) Standard for the Installation of Sprinkler Systems or NFPA 13. In the simplest form, these systems include a series of connected pipes and fittings, with valves, alarm initiating devices, and automatic sprinklers that are supplied by a reliable water supply. For a sprinkler system contractor, the decisions relating to the design and installation of the automatic fire sprinkler system are made with input from many different sources. These include the locally adopted fire and building codes, nationally recognized standards such as NFPA, the authority having jurisdiction (AHJ), the engineer of record, the architect, the construction manager, the general contractor, the insurance carrier and the owner. The selection of the proper design choices requires research and forethought and should result in the application of education and experience to create the appropriate protection for the hazards present. Of the many factors involved in the decision process, one important choice is the type of automatic sprinkler system that will be installed. Some buildings may require more than one type of system. The four primary systems are the wet pipe system, the dry pipe system, the preaction system and the deluge system. Some basic information on these systems follows. The selection of the proper design choices requires research and forethought. The wet pipe sprinkler system is, in general, the most cost-effective, the most versatile as far as protection strategies and pipe installation are concerned, and the easiest to maintain. Its cost effectiveness is based on its having fewer components, requiring less maintenance and testing and having fewer design restrictions than any of the other three types of systems. Wet pipe systems are installed where temperatures will not fall below 40°F (4°C) and where one of the design objectives is to put water on a relatively small fire as quickly as possible. In a wet pipe system, components are arranged in such a manner that, as soon as the heat from a fire operates the heat responsive element of an automatic sprinkler, the water is discharged through the sprinkler to the fire. It is possible to design these systems for fire control – controlling a fire to the room or area of origin until the fire department arrives and extinguishes the fire; fire suppression – actually suppressing the fire; or life safety protection – as in residential occupancies. The wet pipe system can also include additives such as antifreeze or foam concentrate. Is there a possibility or potential for freezing anywhere the water-filled components are installed? Is interior or exterior corrosion a factor to be concerned about? What are the appropriate materials for a wet pipe system? When sprinkler systems are required in buildings, or areas of buildings, where the ambient temperature will not be maintained above 40°F (4°C) dry pipe systems are an option. The dry pipe system is more expensive than the wet pipe system; requires more maintenance and testing (weekly, monthly, annually, and over its lifetime); and has additional design requirements beyond those of the basic wet pipe system. Low differential valves that require less air pressure to keep them closed. Dry pipe valves that can be reset without removing the cover plate (external reset). Packaged dry pipe valves that are trimmed and ready to set in place. Dry pipe valves with solenoid valves that hold the clapper of the dry pipe valve closed (instead of air pressure). Calculation programs that more accurately determine the delay in operation of the dry valve from the time the first automatic sprinkler operates until water reaches the open sprinkler or sprinklers. Can the system be designed without trapping piping or will auxiliary drains be required? Is there room to pitch the piping so it drains properly? Are the pipe type, the fittings, the pipe joining methods, and the appropriate gaskets determined? Will there be an adequately heated room for the water supply the dry pipe valve assembly? Will compressed air or nitrogen be used, and how much moisture will there be in the air or the system piping? What is the appropriate make and model of the dry pipe valve for the installation? Will the system design deliver water to the open or operating sprinklers in accordance with NFPA requirements? The preaction system is similar to a dry pipe system. It has a similar valve, and in general the same pipe, fittings, alarm initiating devices, and automatic sprinklers. In addition to the sprinkler system, however, the preaction system incorporates a detection system. Preaction systems areusually less cost-effective than the dry pipe systems and require additional maintenance and testing as well as maintenance and testing of the detection system. There are many types of detectors and detection systems that can be used with the preaction systems. It is in the system designer’s best interest to work closely with the owner and the architect to utilize the type of detection system that is appropriate for each specific area or system. An example of such an area is the data or computer room, where the products of combustion can do as much damage to sensitive equipment as the thermal damage from a fire or the resultant application of water. In these rooms, an air sampling detection system may be more appropriate than smoke detectors. The air sampling system may detect particles of combustion before the human eye or nose does and can send signals or warnings before there is actual smoke damage or a fire or before water is necessary. A preaction system can be designed to operate as a dry system – non-interlocked, or more commonly they are designed to operate in conjunction with a detection system. These include single-interlocked and double-interlocked systems. The preaction system can be installed in areas or buildings where either wet or dry systems are appropriate based on temperatures, but where accidental discharge of water might be a critical issue, such as in areas that are protecting valuables, irreplaceable articles, freezers, or computer or data centers. As defined by NFPA, a non-interlocked preaction system allows water into the piping when either the heat responsive element of an automatic sprinkler operates or when a detection device associated with the preaction system operates. 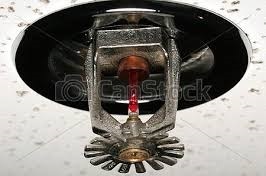 Water will be discharged as soon as it reaches the open automatic sprinkler or the piping will fill with water if the detection device operated first; in an actual fire condition, when the heat responsive element of the automatic sprinkler operates, the water will be discharged on the fire. 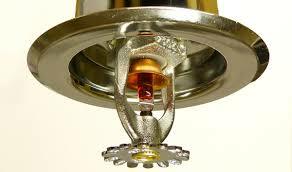 It provides fire detection as well as automatic sprinkler protection. If the detection system operates first, it alerts the building occupants, allowing time to investigate the cause. The system might operate more quickly than a dry system if the detection activates the preaction valve before the heat responsive element of the automatic sprinkler operates. It is more expensive than a dry system. It operates like a dry system if an automatic sprinkler operates, either because it is supposed to or because it has been damaged. A single-interlocked preaction system allows water into the piping after the operation of a detection device, but will not allow water to enter the system if an automatic sprinkler operates or is accidentally damaged and broken or if a pipe or fitting is damaged or broken. The preaction valve does not operate and water does not flow if a pipe, fitting, or automatic sprinkler breaks. If the detection system false alarms, the piping will fill with water, but as long as the heat responsive elements of the sprinklers have not operated water will not flow out of the piping. If a detection signal or alarm is initiated, it may be possible to determine the cause and shut down sensitive equipment before an automatic sprinkler operates. It is more expensive than a non-interlocked system. There can be a delay in water delivery in a fire condition, allowing the fire to grow. In areas that are not subject to freezing, but contain equipment that is sensitive to water, false detection alarms will fill the piping with water that will have to be drained. If the area has a suspended ceiling, each of the sprinklers will be supplied by a vertical 1” pipe called a drop, and every one of the drops would need to be individually drained. In areas subject to freezing, false detection alarms will fill the piping with water; then it must be drained and all of the moisture removed before it freezes. The double-interlocked preaction system is normally found where accidental water discharge is a significant concern and allows water into the piping only after both the heat responsive element of the automatic sprinkler and the detection device has operated. A variation of this system is a cross-zoned, double-interlock preaction system. In this type of preaction system two different detectors or detection zones must operate and the heat responsive element of the automatic sprinkler must operate before water is allowed to enter the piping. If the detection system false alarms, the valve does not operate and water does not fill the piping. It is more expensive than a single-interlock system. There can be a significant delay in water delivery in a fire condition over the non- and single-interlocked systems. The delay would be equivalent to that of a dry pipe sprinkler system. There are additional costs of equipment and maintenance over the other types of sprinkler systems. What type of preaction system is appropriate for the specific conditions of the project? What is the optimal detection system for the area or process that is being protected? Are the pipe type, the fittings, the pipe joining methods and the appropriate gaskets determined? Will supervisory air be required? Is the detection system integrated and will it be commissioned properly? Deluge systems are similar to preaction systems, in most cases utilizing the same valves, pipe, fittings, alarm initiating devices, automatic sprinklers, and detectors, although all of the sprinklers are open and do not include the heat responsive element. Spray nozzles can be used in deluge systems instead of the open automatic sprinklers. The difference between preaction and deluge systems is that with the sprinklers open at all times, neither air nor water can be maintained in the piping. The deluge system requires a detection system to operate and signal the deluge valve, opening the valve and allowing water to flow through the piping and discharge through all of the sprinklers or nozzles simultaneously. Deluge systems can be installed in warm or cold very high hazard areas and the primary objective is to put as much water on a fire as is required to contain or control a severe fire hazard as quickly as possible. These systems are utilized where a large amount of water is necessary quickly such as in flammable and combustible dispensing operations, aircraft hangars, and transformers. The deluge systems frequently include foam concentrates. What is the appropriate detection system? Is the water supply adequate and appropriate for all sprinklers flowing? Where will the discharged water run to and does it require containment? Is the water supply adequate? What are the insurance requirements and will they impact the system design? Will the system be designed with the minimum code compliance or will it be designed for what is best for the client to exceed the minimum requirements? Has the proper hazard analysis been undertaken and have all of the hazards been identified properly and evaluated? Have the automatic sprinklers that are appropriate for the hazards as well as the system been selected? The type of sprinkler system must be determined early in the design process. That decision in turn has implications on the remainder of the system design, from hydraulic criteria to water supply and system components. The owner’s or client’s operations, processes, and overall needs must be included in determining the type of system for a specific project. Finally, long-term effects such as the cost of inspection, testing, and maintenance of the sprinkler and detection systems, as well as life expectancy of the pipe, fittings, and other components must be included in the overall evaluation. ABOUT THE AUTHOR: Scott A. Futrell, PE, FSFPE, CFPS, SET, CFEI, is a fire protection consultant with Futrell Fire Consult & Design, Inc., in Osseo, Minnesota and has over 40 years’ experience designing, specifying, and investigating fire protection system related losses. He is a Fellow in the Society of Fire Protection Engineers and co-author of “Designers Guide to Automatic Sprinkler Systems”, available from the Society of Fire Protection Engineers.